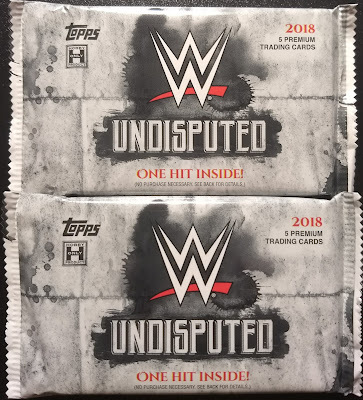 Undisputed is the high-end wrestling offering from Topps. It comes on thick card stock and features 10 hits per 10-pack box, with 8 of those hits guaranteed to be autographs. I didn't buy a whole box, but I did snag some 2018 Topps Undisputed. I found an online shop that was offering Undisputed by the pack at a reasonable price, so I ordered two packs. As I said before, each pack promises a hit among the five cards inside. Based on what I've seen, parallels are a little harder to come by this year, probably due to the fact that there aren't any parallels in the product that aren't serially-numbered. Here are the pack odds. It's too late to send in a NPN request, as that expired at the end of September. I've been sitting on these photographs for quite a while apparently. Most packs give you two or three base cards and one or two inserts. I like Sheamus, so that is a decent base card pull for me. I don't like Roman Reigns as much, but he seems to be pretty popular among wrestling fans. It is pretty nice to get an Andre the Giant appearance in this pack. He was one big dude. 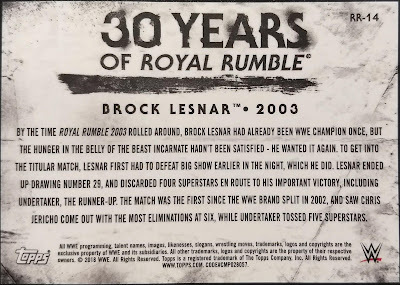 Brock Lesnar irritates me, but I guess if a heel can get under your skin, that means they're doing their job well. The inserts I've seen all focus on 30 Years of Survivor Series and 30 Years of Royal Rumble. There may be other insert sets, but I doubt it. There's just not enough room in the checklist for much more. 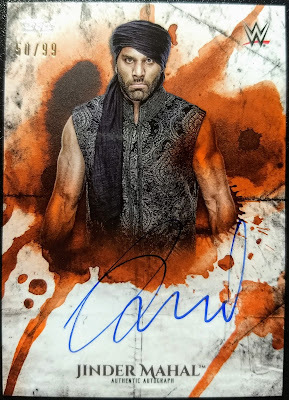 The hit from this first pack is an Orange autograph of Jinder Mahal. He's not one of my favorite wrestlers, but he's a pretty big player on the current roster and I am happy to add his signature to my collection. I don't think I had previously acquired any of his signed cards. I do kind of like his gimmick with the Singh Brothers. It's very much a video game set-up where the Singh Brothers are mini-bosses who pester you while you try to defeat the main boss, Jinder Mahal. They all play their roles very well. 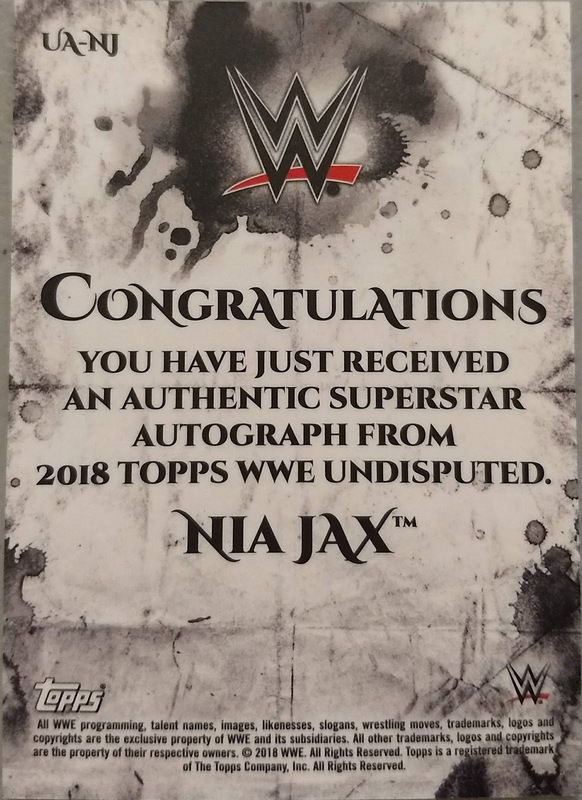 It's nice to get a Bayley card in the second pack, with a cameo appearance by Nia Jax. It is also fun to get a John Cena card in this pack. His new longer haircut kind of throws me for a loop, but that's just because it's different from what I'm used to seeing. Apparently I'm not the only person who was surprised to see it. This pack also had a Royal Rumble card inside, with Lex Luger as the co-winner of the 1994 Royal Rumble. 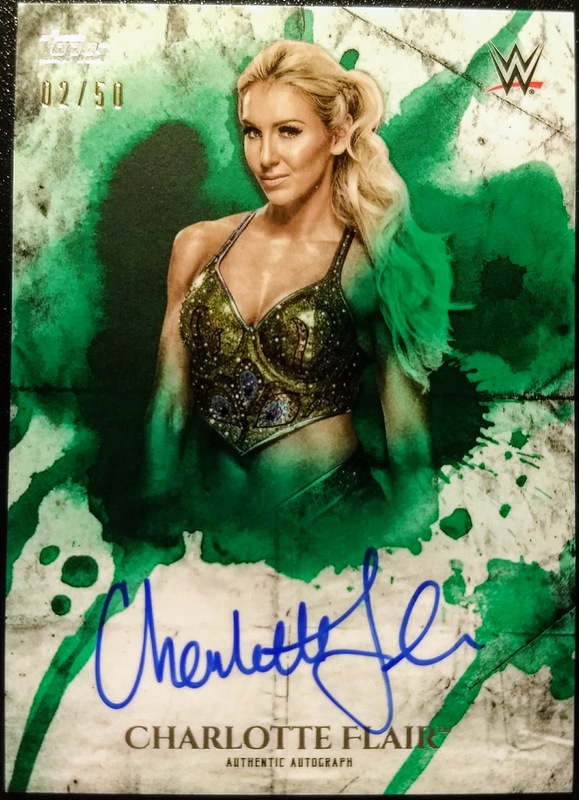 I was pretty happy with the hit in this pack, a Green autograph of Charlotte Flair. This one is numbered # 02 / 50. 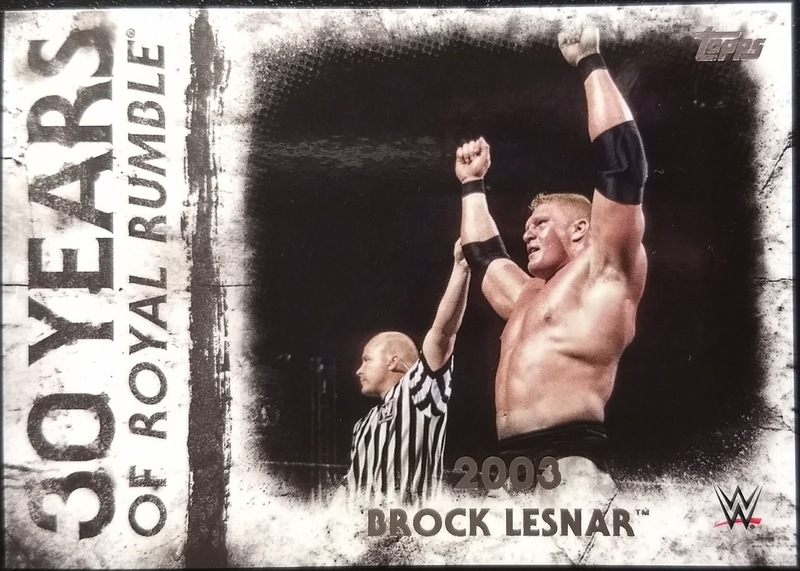 The color splash on these parallels does some weird things to the wrestler photos sometimes, because it overlays the photos and changes their skin and clothing to that color. 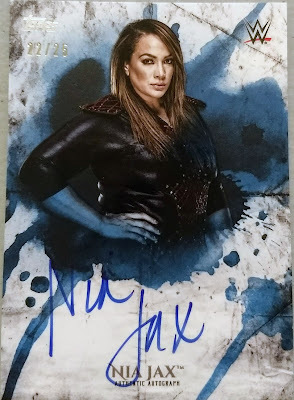 This Nia Jax Blue parallel autograph was an eBay purchase. It is numbered # 22 / 25. I was also watching a Green autograph at the same time, but the Blue only went for a little more than the Green, despite having half the print run. It is a little bothersome that the blue ink of the marker blends in with the blue of the color splash, but I don't think it looks as bad on the actual card. This last pack came from a group break I joined. It was a random pack box break, so there were 10 slots, and the packs from a box were randomly attached to a slot. 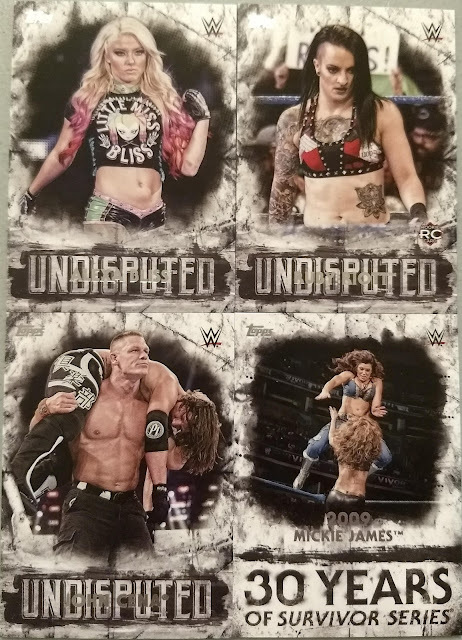 I got some pretty decent base cards, with Alexa Bliss, Ruby Riott, and John Cena. 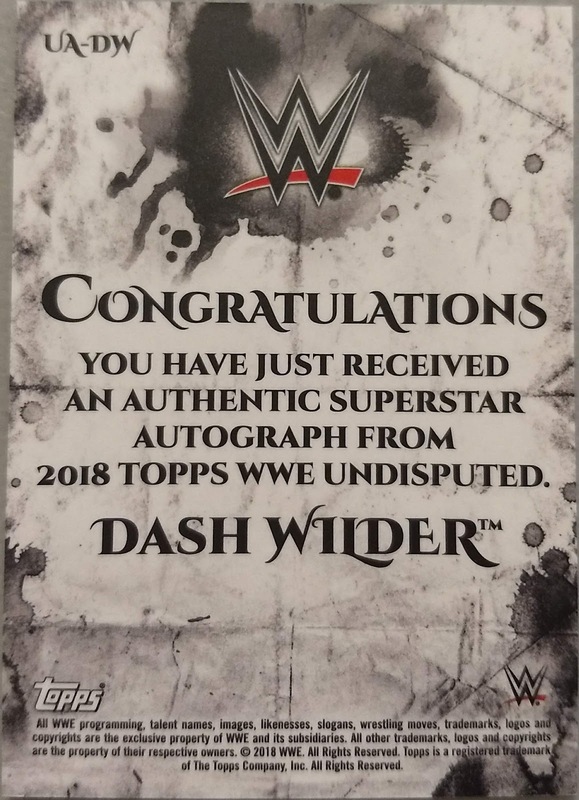 The hit of the pack would have been an awesome pull if it pictured a different wrestler. This is a Purple autograph of Dash Wilder, numbered # 4 / 5. I guess I shouldn't complain too much. I've had much worse results out of group breaks before. 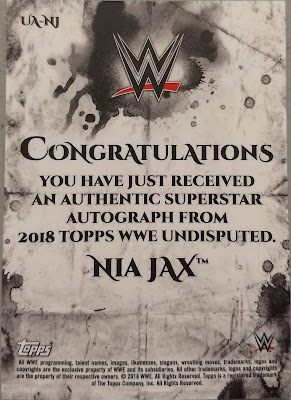 Undisputed is a fun product, with a lot of on-card autographs and parallels to chase. I usually try to get a little of it each year, especially if my favorite wrestlers appear on the checklist. They do very well with Undisputed - not sure how much I care of the different colour parallels - I guess they do it so people have more to chase, get a rainbow and what have you, but one colour would have been fine. 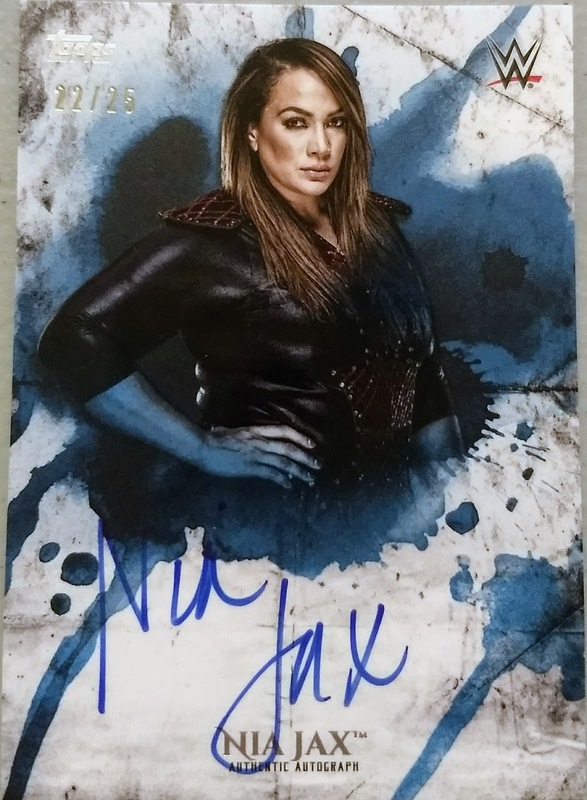 The on card autographs are really nice though. Love the autographs. Wish Topps had Ricky Steamboat sign cards for this product. I would have gone out and bought one. 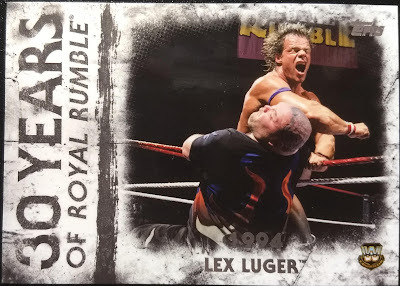 I like the design and I have been watching a couple of autographs from this set but I a, disappointed that the color splotches are on top of the wrestler. The blue and green parallels aren’t bad because they don’t really disrupt he image but the orange splotches bother me. To me 5e wrestler should have been in front of the color. 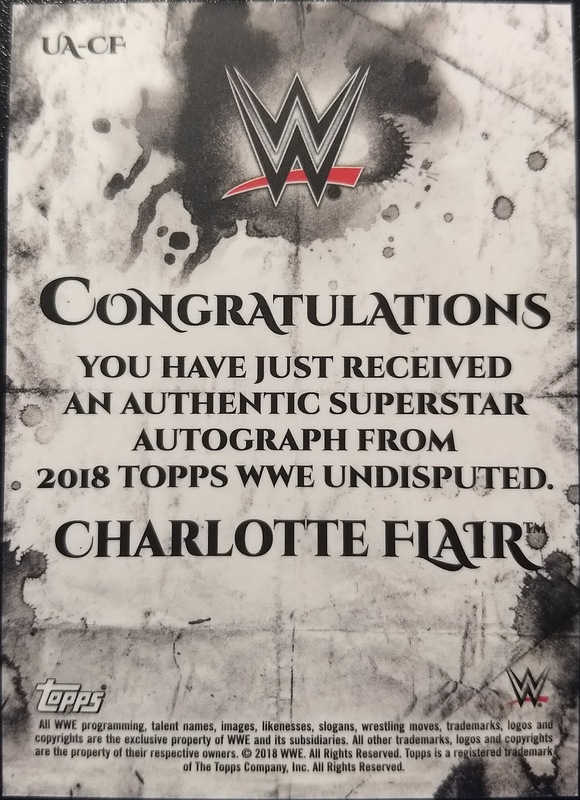 Congrats on the autos....the card design is a little iffy for me, but looks like a great product for most. Those are some sweet cards. I really like the design. I may try to find some of these either in singles or a pack. Great post and a nice pull in those autos. Thanks. Congrats on the new additions to your collection. Charlotte Flair would have been my favorite.